I have been so fortunate to know three of the four generations of Graaffs who have owned De Grendel, an imposing estate on the slopes of the Tygerberg Hills facing Table Mountain, Table Bay and the well-known Robben Island. The Atlantic Ocean has the Benguela current running north past the coast, icy waters from the south Atlantic from which breezes cool the vineyards from summer heat. However, the grapes for De Grendel Rosé 2018 come from the Agter Paarl and Wellington Wine Appellations where they grow on some trellised and some bush vines which are irrigated minimally to sustain them until harvest. Shale soils producing 12 tons per hectare. Still part of the awful drought season, the vines were fortunately disease free. 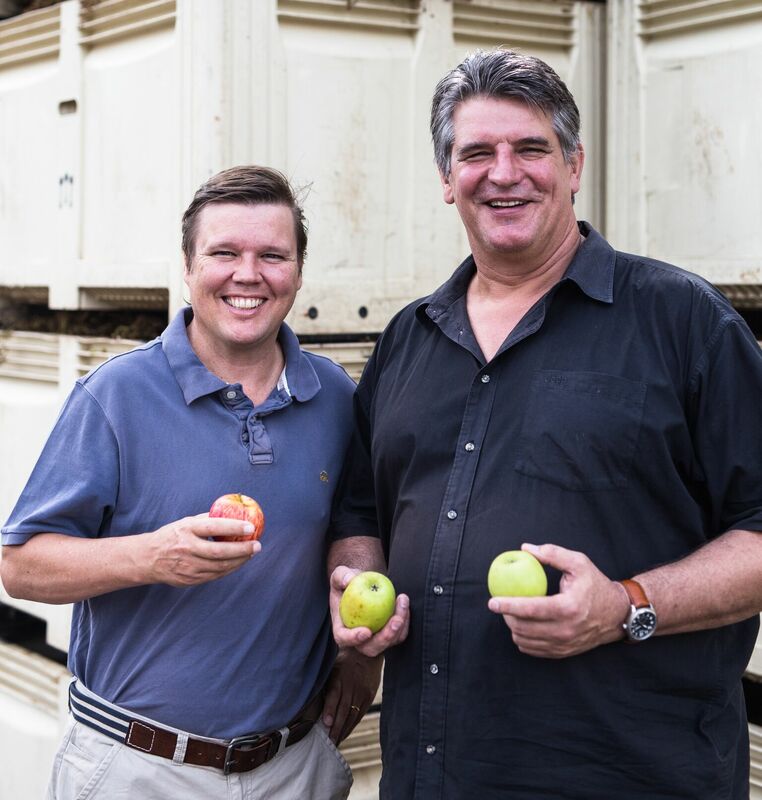 Great care was taken to harvesting at peak ripeness time when the grapes are at their most aromatic and flavourful. The grapes used for the De Grendel Rosé 2018 were 50% Pinotage, packed with fruit, and 50% Cabernet Sauvignon adding superb structure and the fresh acidity. Picked by hand in the early hours of the day, the grapes were brought to the De Grendel Cellar where they were destalked and crushed. Skin contact was allowed for 1 to 2 hourse to extract colour and to make a more delicate style of Rosé. From then on the De Grendel Rosé 2018 was made by Charles Hopkins, founding Cellarmaster and his team, exactly as a white wine with racking off the juice before fermentation. The wine was then prepared for bottling. Bottled under screw cape in a Burgundy shaped bottle with the elegant restrained De Grendel Livery. In the glass, the most delicate of cherry blossom pinks with flashes of violet. The colour of the wine belies the generous ‘sweet’ whiffs of candied sugar, chunky strawberries and touches of raspberry and redcurrant. The nose makes you want to take your first sip – from entry just a lovely mouth full of red berries swirling around. A lovely mid palate and the best of soft endings with a rich and round freshness in the aftertaste. Remember Rosé is not just for summer! This is the perfect glass on its own as a mid-morning refresher, just so crisp and feel good. It is perfect with foods you might want to use to recall summer. I prefer cold dishes, starters such as sashimi of salmon, or a ceviche of a freshly caught kingklip. However, on a sunlit Winter’s day at lunch time, a salad is a great partner. And, my best ever a baked Dalewood Fromagerie Camembert. This would follow your main course or be a perfect lunch time snack. 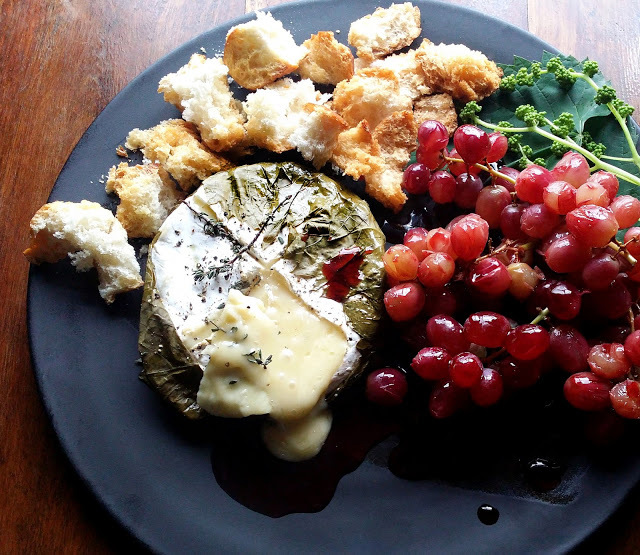 Jane-Anne Hobbs’s Camembert, baked in vine leaves with Verjuice-poached grapes. I see grapes are still readily available in the supermarkets. Click here for her recipe.